It's the little differences that make life interesting. Take Taft Point, for instance: stand at the railing here, and the elevation is 7,500 feet (2,285 meters). Take a step to the north, and the elevation becomes 4,000 feet (1,200 meters). Just thinking about that step can do funny things to your stomach. You see a lot of people at Taft Point lying on their bellies and inching out towards, but never getting quite up to, the edge of the cliff. And you see a lot more people touching the iron railings but never actually putting their weight against them. 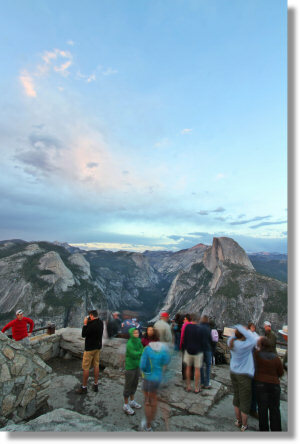 If you like your spectacular vistas mingled with a touch of fear, then the hikes along Glacier Point Road are for you. Though Glacier Point itself has solid stone walls that people seem willing to lean over, Taft Point has just a single spindly iron railing, and Dewey, Stanford, and Crocker Points, along with Sentinel Dome, have no protections of any kind for the absentminded hiker. You'll definitely want to keep a close eye on your kids if you're hiking along Glacier Point Road - but the views are worth it. You haven't really seen Yosemite Valley until you've looked down on it from one of the trails that start from along the 16 miles (26 km) of Glacier Point Road. 2019 Opening Date: The Glacier Point Road usually opens a few weeks before the Tioga Road does, sometimes as early as April (see its historical opening dates below), but the park service has announced that due to heavy snowfall this year, it's unlikely to open before Memorial Day, which would be its latest opening since 2011. The NPS website has official details. Glacier Point Road Lodging: There may have never been a better balcony view than the one from the Glacier Point Hotel, which was completed in 1917. Has there ever been a finer place to order a post-hike beer? We'll never know, because the hotel burned down in 1969. The only summer lodging available along the Glacier Point Road now is the Bridalveil Creek Campground, roughly halfway along the Glacier Point Road's 16-mile length. In the winter, the Glacier Point cafeteria and the Ostrander Lake Ski Hut both serve as overnight lodging for cross-country skiers (reservations required). The closest conventional lodging is Yosemite West, located off Highway 41 a little under half a mile south of Glacier Point Road's western terminus. It's a collection of privately owned properties, partly inside and partly outside park boundaries, with a bed & breakfast and a variety of cabin & condo rentals. Food: The cafeteria at Glacier Point serves the sort of fast food, candy, and sundry you typically find at a gas station food mart. Gas: There's no gas along Glacier Point Road; your nearest alternative is Wawona, 17 miles (27 km) south of the Glacier Point Road turnoff. Bathrooms: There are outhouse-style bathrooms scattered all along the Glacier Point Road, including at Summit Meadow and most of the trailheads. Until repairs are completed at the Glacier Point bathrooms, however (and they seem to have been underway for several years now), the only available plumbing is at Chinquapin, the turnoff where the Glacier Point Road begins. In the winter you can also find working bathrooms (and food, too, for that matter), at Badger Pass. Seasonal Closures: The Glacier Point Road closes in the winter. More precisely, it closes five miles in, at Badger Pass, and the remaining 10 miles of the road to Glacier Point are converted to a ski & snowshoe trail. It typically closes after the first big winter storm arrives in November and opens again in late May, but both dates can vary. Badger Pass usually doesn't open until a month or so after the road closes and closes a month or so before the road opens again in the spring, and during these intervals the entire road will be closed. Bicycle Weekend: People thinking of bicycling in Yosemite are usually thinking about the hill-free bike paths in eastern Yosemite Valley, which are indeed a lot of fun (and you can rent bicycles at Half Dome Village, though it's none too cheap). But if you've got quads of steel, you should know that nearly every year, the weekend before Glacier Point Road opens to general traffic, it opens exclusively to bicycles, so for a couple days you can ride in peace and tilt over at 60 degrees on that hairpin turn just before Glacier Point without worrying about distracted drivers in rented RVs (though caveats apply: you might encounter snowplows or other work crews, and the park service doesn't generally guarantee that the road will be safe or passable all the way to Glacier Point). The park service usually does a bicycle weekend for the Tioga Road, too, in case you have not just quads of steel but the lungs of a roided-up sherpa as well. The tricky bit is that it's not at all well publicized - I don't know of any public sources that reliably announce when the date will be - and the date for bicycle weekend is usually only set a day or two ahead of time. So you need a flexible schedule and a bit of luck. If I hear about it in time, I'll post it here and on the yosemite hikes twitter feed. * For hikes that have more than one possible route, this table lists distance and elevation for the shortest route. Or the longest one. Whatever seemed more useful at the moment. 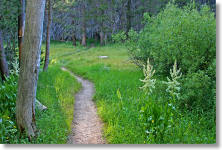 Listed distances for most hikes are round trip; click on hike names for more details.